LONG BEACH — The first step of a six-phase project to repair the Naples Seawall was approved by the California Coastal Commission, at its Oct. 9 meeting. The Naples Island canals, which were constructed along with the island they run through, were originally built in the early 1900s. The existing crumbling concrete seawalls seen today were constructed in 1938, following damage caused by the magnitude 6.4 Long Beach earthquake of 1933. Looking at the crumbling structure, engineers knew that the seawall needed a facelift. What they weren’t sure about was how to do it. “Commission staff asked the city to examine an alternative that would involve the removal of the existing concrete wall and replacement of that wall in the same location, or in a landward location, to avoid narrowing the channel and avoid the loss of soft-bottom habitat and eel grass,” said Coastal Commission planner Jack Ainsworth. After in-depth analysis, engineers concluded that the option of keeping the existing seawall in place as shoring for a new wall landward is not feasible. The old seawall is supported by a system of tiebacks — and if they were removed, the seawall would likely fail. This method would be further complicated by the existence of an even older seawall and grout buried behind the existing one. All of this material would have to be removed before sheet piling could begin for a new structure. “Assuming these shoring and stability issues could be overcome, the cost of the repair — just for the first phase — would reach up to $15 million for the proposed wall, to between $35 million and $36 million depending on what (other) option is selected,” Ainsworth said. Current plans are that the new seawall project is to be financed by $9 million of reserve Tidelands funds. The first phase of the repair involves a 1,000-foot segment of the Rivo Alto Canal, where interlocking sheet piles will be placed against the old seawall, concrete will be poured between the gaps and a cap will be placed on top. The new seawall will extend 18 inches into the canal, reducing the overall canal width by 3 feet (from 69 to 65.9 feet). The permit for construction has been conditioned to prohibit the repairs of any new seawalls that would narrow the channel further. Other parts of the project include working to expand the soft-bottom habitat of the Colorado Lagoon, which is currently undergoing a major restoration project, by about 21,000 square feet. In addition, eelgrass would be grown at the Marine Stadium, to supplement eelgrass that will be destroyed due to construction of a new barrier in the canal. 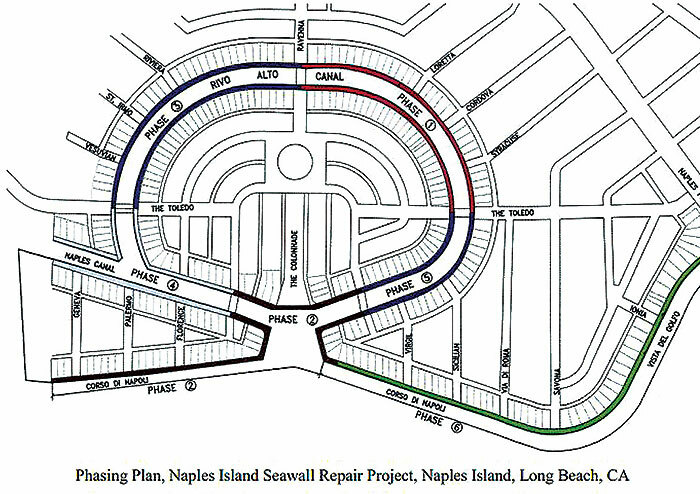 The remaining five phases of the six-phase $60 million project will include future repairs to Corso Di Napoli, Vista Del Golfo, and Naples canals.